Within the YouTube beauty community, videos pitting different subscription box services against one another are wildly popular. Even within the book blogging and vlogging community, subscription box unboxings are incredibly popular, too: the last few weeks of the month are a flurry of tastefully edited Instagram photos, blog posts, and videos revealing the contents of a whole host of boxes. Almost without fail, these posts are complimentary. However, with a monthly price tag of between $30-$50, these uncritical unboxings are not helpful to the average bookish consumer. Most of us aren’t willing to stake a not-unsubstantial amount of money on a subscription that is not a safe bet. Myself included. With this in mind, I decided to try out two bookish subscription boxes to see if they are truly worth the hype: OwlCrate and Booked Box. 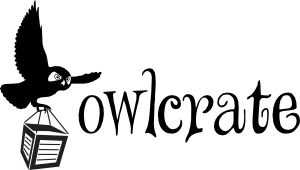 Today I am going to be bringing you a review of OwlCrate. OwlCrates start at $29.99 per month (plus $6.99 shipping and handling) and are about one and two dollars cheaper per box if you subscribe for three or six months respectively. Boxes ship out around the 20th of each month and you are auto-renewed for membership unless you opt out (btw, I am not sure which day of the month OwlCrate auto-renew memberships). The boxes ship via USPS Priority Mail within the United States and you are provided with a tracking number once they have shipped. My box shipped from Portland and took about two days to make its way to me in Northern California. May 2016 OwlCrate . . . After my mom found the goodies she liked! haha! My first OwlCrate was the May “steampunk” box. In the box I received the book Everland (in hardcover) and an author letter by Wendy Spinale, an adjustable ring inspired by the Infernal Devices trilogy from Sparks Emporium (@roylgyp on IG), a skeleton key necklace from Crystal Compass Designs (@crystalcompassdesign on IG), a clockwork brooch from Elope Inc. (@elope.inc on IG), a literary print in homage to J.M. Barrie from Creative Daffodil Studio (@creativedaffodil on IG), a set of gold temporary tattoos, and steampunk-inspired nail wraps from Espionage Cosmetics (@espionage_cosmetics). Quite. A. Haul. In terms of value for money, the contents of my OwlCrate well exceed the price of the box (about $37 once you figure in shipping); if I were to recreate the contents of the box myself, I would have spent more than double the price and almost certainly have gotten myself trapped in the bourgeois click-hole that is Etsy for the better part of an afternoon.
. . . Which brings me to another point: many of the bookish goodies that are in OwlCrate have been sourced by independent artisans. So, if you like an item in your OwlCrate you can look for additional items via an artisan’s independent online shop. As such, by supporting Owl Crate, your supporting multiple independent businesses each month—and that, y’all ain’t a bad thing! Beyond their value, the contents of my OwlCrate were enjoyable, high quality, and sharable. I ended up giving my necklace and pin to my mom, a steampunk enthusiast, who I knew would get a bigger kick and more use out of the items than me. Needless to say, my mother was thrilled that I shared and she is eagerly awaiting my next box! Since I enjoyed my May box so much, provided my June box is also a success—and they have teased that there will be a mini-Funko Pop! in this month’s crate—I will extend my subscription. Yes, folks: OwlCrate is worth the hype.